Good Stuff NW: Cooking with Kids: Bake Cookies! 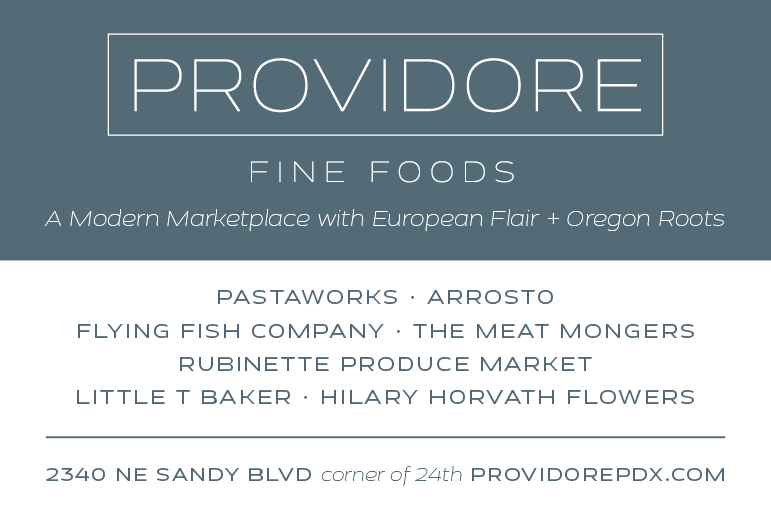 So a whole cloudy-rainy-Northwest-fall day to hang out seemed the perfect opportunity to bake together. 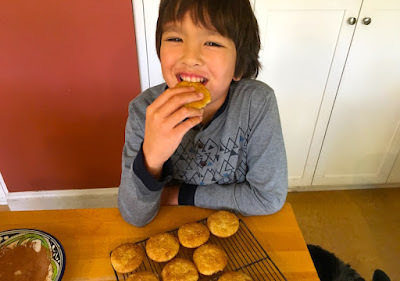 I had been thinking of making cookies with him, and one of my favorite cookies at his age—any age, to be truthful—were snickerdoodles, with their sugar cookie-coated-in cinnamon taste, soft-rather-than-hard texture and heavenly smell. Plus at seven (he'd correct me, saying, "Seven-and-a-half, Auntie!") 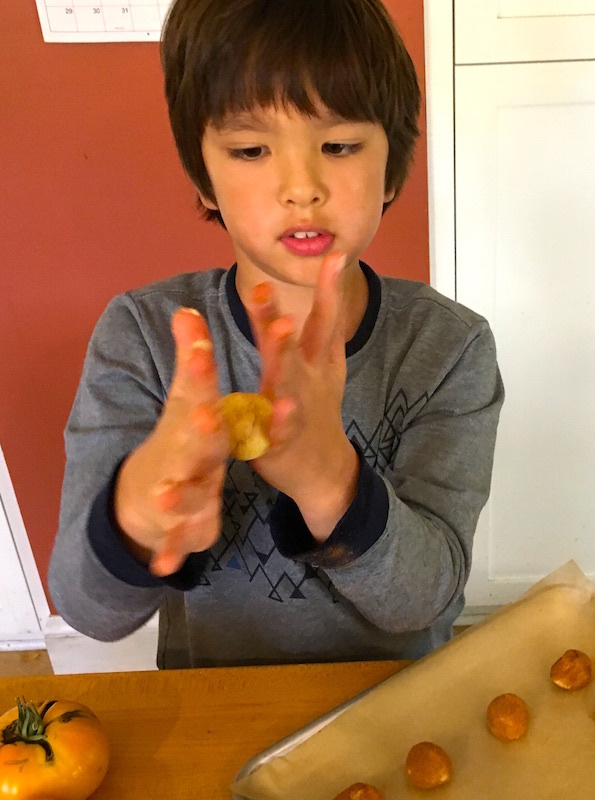 he now has the manual dexterity to be able to gently roll the little balls of dough without squishing them into globby lumps. 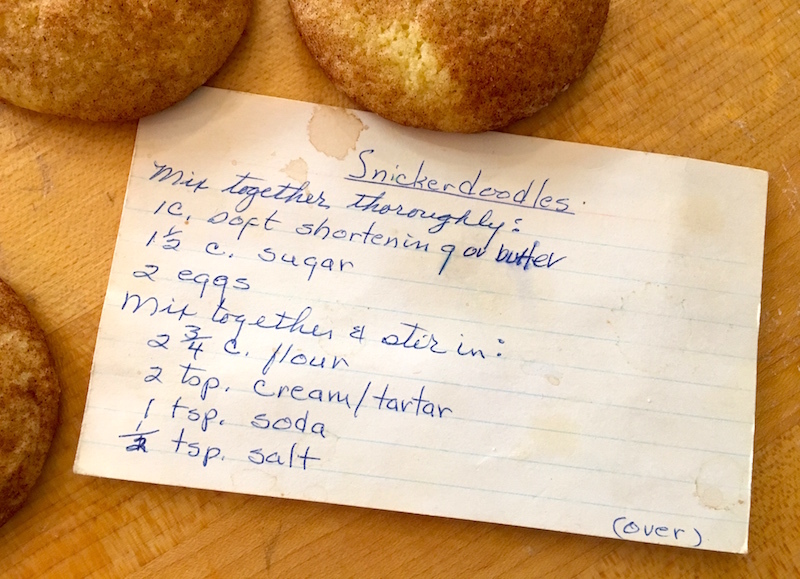 It also gave us the opportunity to talk about a little family history, since we were using my mother's recipe, written in her own hand, and to talk about what it was like growing up making cookies with her. I had to explain what "tsp." and "Tbsp." meant, and talk about how many "1/4 tsp." would fit into "1 tsp." (math! ), and there were the inevitable requests to taste the dough between additions of sugar, butter, flour and eggs. The recipe makes almost five dozen small cookies and the whole process took a little more than two hours, just about a perfect amount of time for his age, and the reward of those soft, cinnamon-scented cookies may just bring him back to make more. 1 1/2 c. sugar plus 2 Tbsp. In a stand mixer, cream the butter and shortening together, about 2 minutes on medium-high. Add 1 1/2 c. sugar and eggs and beat into butter mixture for another 2 minutes. In small mixing bowl combine flour, cream of tartar, soda and salt. Add flour mixture to shortening mixture 1/2 cup at a time, beating slowly at first until combined before adding the next half-cup. Chill the dough for one hour. While dough chills, mix together 2 Tbsp. sugar and 2 tsp. cinnamon in a flat bowl. When dough is chilled, roll into balls the size of walnuts, then roll each ball to coat in the cinnamon-sugar mixture. Place 2" apart on a parchment-covered baking sheet. Bake until lightly browned but still soft, 8-10 minutes.